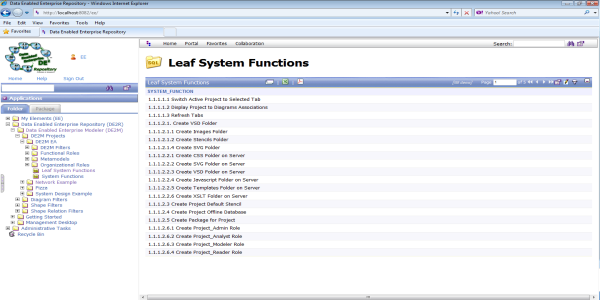 All data from Microsoft Visio is saved into DE2 Repository. 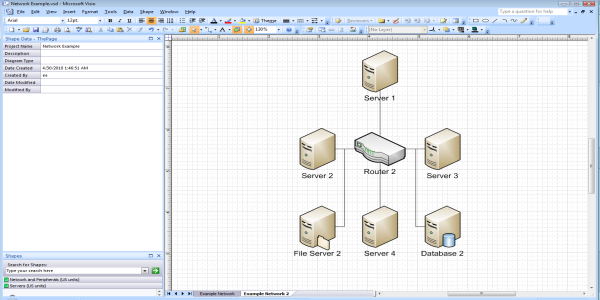 All data can be edited in Visio or DE2 Repository and synchronized. No need to redraw anything! 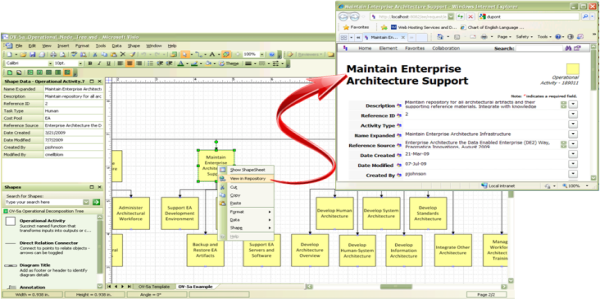 DE2M supports all stencils and diagrams from Visio 2007 professional and earlier versions. Save your investment in modeling time and move forward. 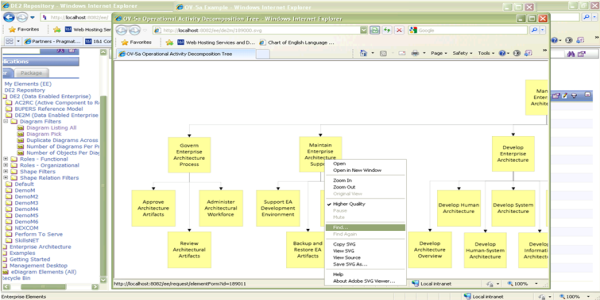 View your Visio diagrams online as Navigable SVG images with hyperlinks, pan, and zoom. 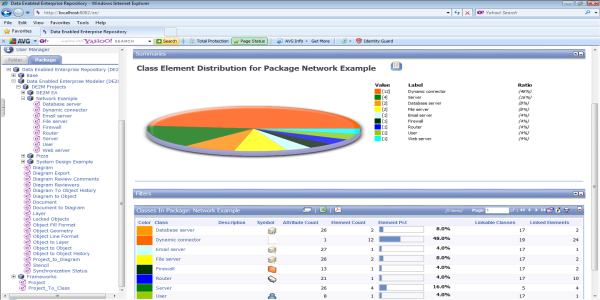 Analyze data across all your diagrams with powerful online reporting. Use your own queries or those we provide for a quick start. Your analysis and decision making requires flexibility to communicate data. Here are just a few possibilities. Charts and Graphs are wonderful but sometimes tables are the best option. Our tabular reports can be sorted, ordered, searched, and even exported to Excel and Adobe PDF with just a click! With DE2 Repository and DE2M there are no restrictions to the data you can capture, transform and optimize. 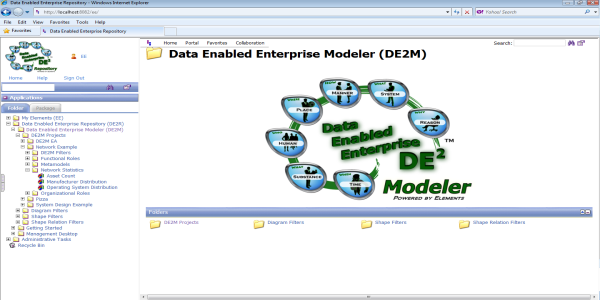 Both support a fully customizable metamodel and multiple ways to import data. Analysis from the start. Several reports and portals are automatically created for you! There is no limit to your DE2 Repository experience. Anything can be added to a portal page. 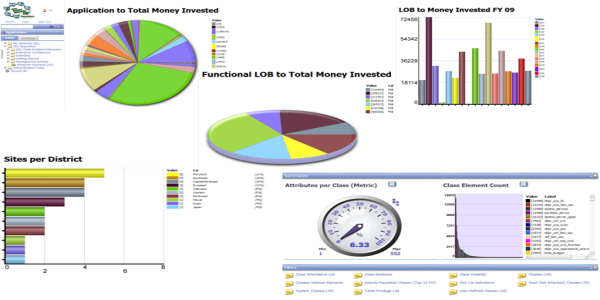 Charts, tables, even reports. 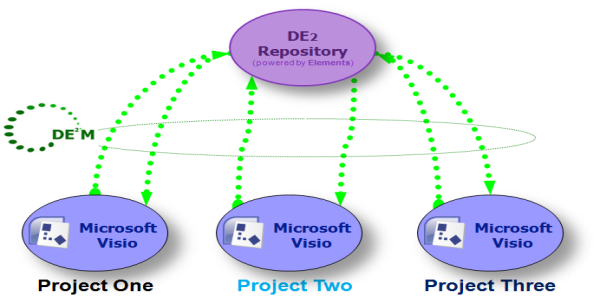 Your project can share a single DE2 repository while controlling access with individual project permissions. 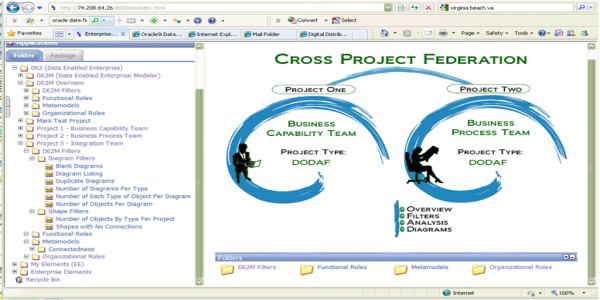 Allow managers to view and coordinate across many projects. Data can easily be shared across projects. 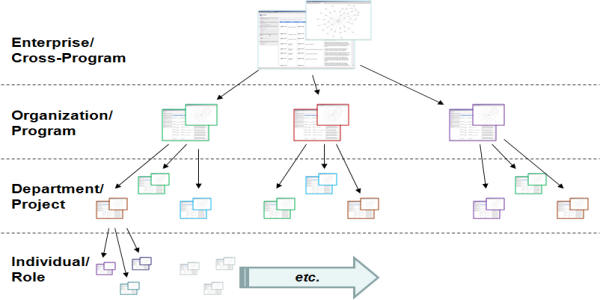 Using DE2M, Drop objects from another project directly into your diagrams. DE2 Repository comes with prebuilt project roles including Admins, Architects, Analysts, Designers, Contributors, and Readers. A single user may have many roles on different projects. To protect your data we automatically apply security as your metamodel is created. Security is fully and easily customizable to give you the best experience possible. Does your company use or plan to use Microsoft Visio to model information such as business processes, network diagrams, facility architecture, or organizational constructs? 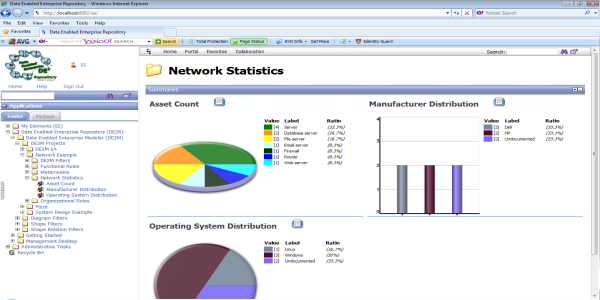 Are you looking for a way to consolidate this information, analyze, manage, and control it? How about view and edit the combined information and diagrams online or offline through a security controlled central repository? Then DE2M is for you! DE2R is not only the backbone of DE2M. 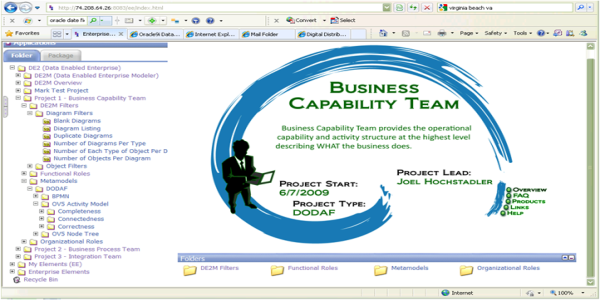 It is extremely flexible, offering endless possibilities for customization, reporting, and user control. 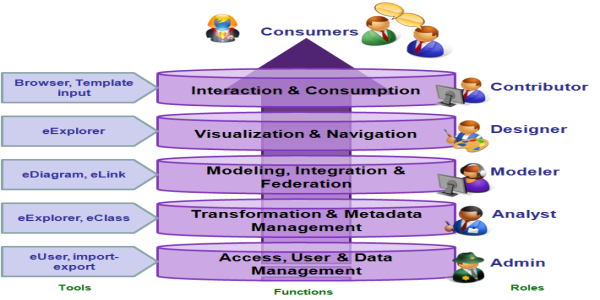 It also has the ability to import data from almost any existing data source including other popular modeling tools. Copyright 2016 Pragmatica Innovations All Rights Reserved. Please contact us with questions or comments.